EnergyParking is based on the fact that cars in an urban environment are parked much more frequently than they are on the road. From today, this stationary time will do more than just cost money; it will also be put to effective use. EnergyParking uses the time the car is parked effectively – in parking facilities, while shopping, eating in a restaurant, staying at a hotel or being at the movies. For the driver EnergyParking is as simple as filling up with petrol; yet also being able to select between different electricity suppliers and even power generation types. 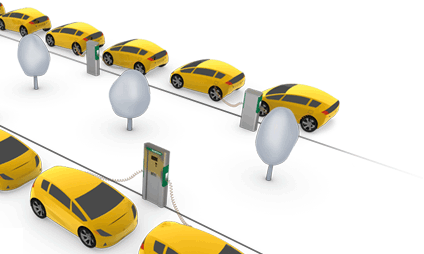 Charging stations can of course also be used as pay and display machines by combustion engine vehicles. EnergyParking is a new source of income for its operator that also rises his image. The charging stations can also be used for your own or third-party advertising, or just display the city insignia. Existing pay and display machines are easily replaced by EnergyParking machines.